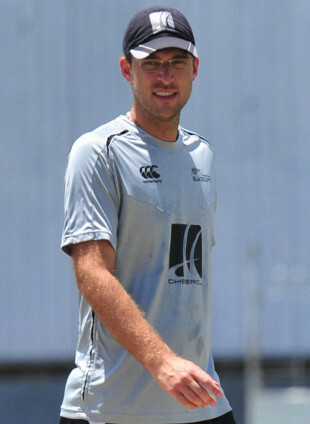 Daniel Vettori will have mixed memories of his only Test at the Sinhalese Sports Club. He bowled with splendid control and variation to take his 50th Test wicket in 14 matches at the age of 19, turning in a then career-best 6 for 64. But there was scant support from the other end and Sri Lanka, through a last-wicket stand of 71, set New Zealand a target of 296 in six sessions and 22 minutes. They were bowled out for 131. A series that had started favourably for New Zealand ended with two heavy defeats. On Wednesday Vettori will walk out at the SSC again, now aged 30 and captain of the side - in fact the most powerful captain in world cricket - hoping fate doesn't repeat itself with the result of this Test. New Zealand need to win to square the series, and Vettori has called on his batsmen to play responsibly and with grit. Winning here won't be easy, as anyone who follows Sri Lankan cricket will tell you. The last visiting side to win at the SSC, in 2004, were Australia, who displayed mental superiority under pressure. Hurting with three and five wickets down before 100 in both innings, Australia were lifted each time by double-century stands. The key to winning in Sri Lanka has always been to bat long periods, to try and grind down Sri Lanka's spinners and graft it out. Vettori is hopeful of his side following that route to success. "We proved that we can bat long periods of time but we need to turn the 30s and 40s into something big and that's going to be the difference between the two sides," Vettori said ahead of New Zealand's final practice session. "If you look at our last scorecard you'll see [Tim] McIntosh had a high of 68 and they had two centurions. That was the big difference between us." New Zealand battled in patches in Galle - a fact Vettori brought up on occasion - but were undone by the lack of solidity at the top, almost a naivety among inexperienced batsmen. That needs to change if New Zealand are to progress but Vettori feels the change can come only from the individuals themselves; there was only so much he can do to snap them out of their mindset. "In a lot of ways it's not my responsibility. It's up to them to get themselves out of it," he said. "A good Test player finds a way to score runs in whatever mode it is. We're selling ourselves a little bit short with some of our performances and some guys are not just grinding it out. Look at [Mahela] Jayawardene in the first Test - he almost dead-batted his way to a hundred. He was happy with his performance and he made sure he got the job done. That's the responsibility that our guys have to get on board." The changes, according to Vettori, had to be more about technique than personnel. New Zealand need to find an ability to sustain themselves longer in the game. "There were periods over time when were pleased with our performance on one day but we've got to ensure that replicates itself on the second day." Sri Lanka's seamers, especially Thilan Thushara, proved a pain for New Zealand in Galle but, with Kumar Sangakkara indicating that Sri Lanka were seriously considering playing three slow bowlers, Vettori said his batsmen would focus on the spinners. "We know the quality of the spinners and put a lot of attention into them. We played them particularly well, better than I've seen teams play spin," Vettori said. "I was happy with that. Maybe they had a lot more security with the seamers. For them to have such a dominant role in Tests is something we need to assess. But we need to kick up our gameplan against the spinners." One mode of tackling Muttiah Muralitharan was the sweep shot, which, contrary to concerns doing the rounds, was not a problem with New Zealand's batsmen. "The sweep shot is used by a lot of players across the world to Muralitharan and I think that's the only guy you should use it against," Vettori said. "Mendis bowls it faster and we've worked hard on it. We talked a lot about it with Saqlain [Mushaq, the bowling consultant] and myself being a spinner when I see someone start sweeping me I find it the most difficult. "I'm the only one to have played a Test at the SSC and I have to try and reflect back on that," Vettori said. "Back then we didn't get enough runs to put pressure on Sri Lanka. You do try and relive some of your experiences. The good thing about coming to Sri Lanka is that the pitches are pretty similar so we should be prepared." Eleven years ago New Zealand arrived at the SSC after a hammering in the second Test and disappointed themselves by losing the series with another big defeat. The fate of this contest depends on their ability to hit back hard.